Gartner has turned its annual Hype Cycling gaze upon data management and found that – shock – expectations of Blockchain remain hopelessly inflated. The Hype Cycle chart is an illustration of the analysts' theory that tech follows a depressingly familiar path every time a new shiny appears. It is first lauded by some press, is subject to marketing bluster, before admins at the coalface realise that, hey, maybe it doesn't work as promised and spend the next few years trying to make the thing actually function in the real world. The cycle is measured in years, and entire technologies can disappear into obscurity from the heights of hype without ever becoming useful. Gartner squeezed out such a chart for Emerging Technology in August, which was a painful illustration, for investors at least, of how quickly a bubble can burst. For September, it is the turn of the somewhat more sober landscape of data management. Hadoop received a bit of a kicking in Gartner's 2017 report, which reckoned that enterprises saw more benefit in cloud-based data options than dealing with complexity of the Hadoop stack. 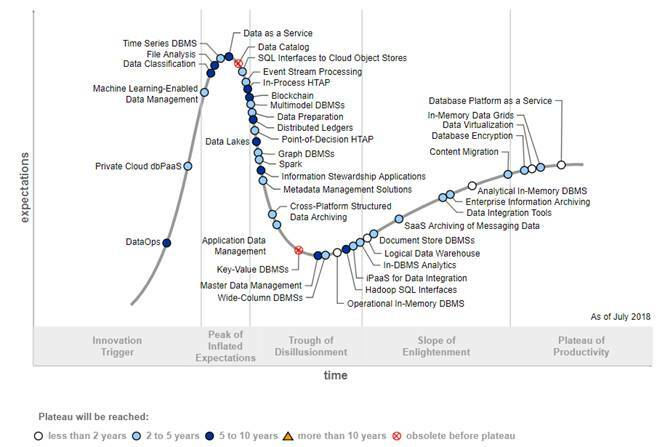 As such, Hadoop distributions were flagged as obsolete and, sure enough, by 2018 the technology had disappeared almost completely from the charts, leaving behind only the Hadoop SQL Interface still toiling in what Gartner cheerily referred to as the "Trough of Disillusionment". Arriving in the first part of the Hype Cycle, or "Innovation Trigger" as Gartner branded it ("Farting Fairy Dust" would be our preference) is DataOps. Fresh from inflicting the term DevOps on all and sundry (even Visual Studio greybeards could not escape) analysts have devised a new term for a practice "without any standards or frameworks", as Gartner research veep Nick Heudecker put it. The practice is geared towards sorting out the flows of data within an organisation to meet the needs of consumers. If DevOps is anything to go by, we can expect to see DataOps rapidly move through the Hype Cycle, cresting the "Peak of Inflated Expectations" before harassed DBAs give their managers a bit of a reality check and it makes its way through the "Trough of Disillusionment" into the "Slope of Enlightenment" and starts becoming useful. Starkly clear in Gartner's Hype Cycle is that there continues to be little notable innovation in the sector with the only standouts being dbPaaS (eugh, database platform-as-a-service), offering a stepping stone from private to public cloud for businesses, and the tortuously named Machine Learning-Enabled Data Management. Gartner's Adam Ronthal reckoned dbPaaS represents a handy option for organisations unable to make the leap into the public cloud due to restrictions such as regulatory challenges. The analysts forecast that the technology is less than two years away from mainstream adoption, and with vendors already moving to a "cloud first" delivery model, it could skip the "Trough of Disillusionment" entirely and skip directly to the "Plateau of Productivity" as admins continue cloud implementations. Or maybe not. Machine learning is very much the buzzphrase of the moment. While advances in artificial intelligence continue apace, the promise of database analytics able to suggest better queries or tuning of performance via a mythical AI may well be undone after the period of maximum hype, as DBAs point out that such tools are simply more complex algorithms. Not a magical machine brain.